Did you happen to miss Cloudy with a Chance of Meatballs, thinking you had to see its 2009 predecessor before catching the sequel? 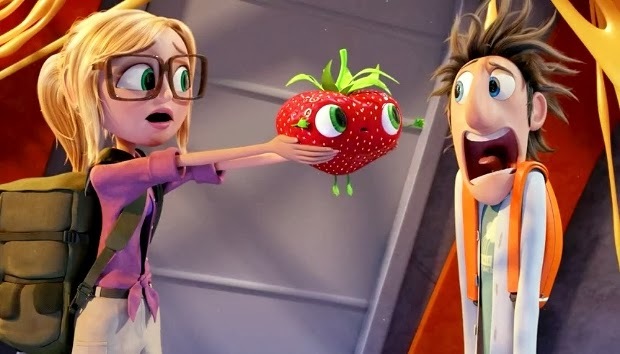 No worries, the makers of Cloudy with a Chance of Meatballs 2 spend the first five minutes of their subpar sequel recapping the original, a handy reminder just how inferior Flint Lockwood's second cinematic outing is to his first. Lockwood and his gang of geeks are back, exiled from Swallow Falls after the wussy inventor's FLDSMDFR food machine inundated their island nation with super-dupersized cheeseburgers, hot dogs and T-bone steaks, Flint landing a gig at Live Corp, a Google-esque enterprise run by a nefarious, wholly-annoying Steve Jobs knockoff, Chester V.
With rather unscrupulous plans for the still-operational FLDSMDFR (disregard the fact the thing was essentially nuked in the first film), Chester sends Lockwood and his pals back to Swallow Falls to search for the contraption only to find the place has been turned into what I'm ingeniously dubbing "The Island of Misfit Food". And that's finally when CWACOM2 (acronym form from this point forward) springs to life, roughly halfway though, with the introduction of a slew of organic – as in actually alive – eats, the living food thingys foodimals. Strawberries, bananas, potatoes, marshmallows — you name the edible item, it's been outfitted with eyes, mouth and a creative name the characters of the movie deliver on cue for maximum merchandising effect. Taking over for the we've-moved-on-to-working-with-Channing Tatum team of Phil Lord and Chris Miller, writing/directing duo Cody Cameron and Kris Pearn's treatment of the fully-functioning-food discovery is ripped right out of Jurassic Park, titanic tacos subbing for T.Rex(es), as Mark Mothersbaugh's soundtrack swells up with sounds of "wonderment". While it's by far the best CWACOM2 has to offer, Cameron and Pearn can't touch the whiz-bang joy of the original. The twosome's script is akin to that plate of leftovers that's been sitting in the back of your fridge for the past week — moldy. Loaded with lame puns and bathroom humor, Cameron and Pearn clearly don't get clever – or sensible – comedy. Lest you consider dead mom jokes to be hilarious.